New York Press Release: The new musical by Marshall Pailet (Claudio Quest, Triassic Parq) and A.D. Penedo (The Three Times She Knocked), Who’s Your Baghdaddy? Or How I Started The Iraq War, will get its Off-Broadway premiere this Fall. Directed by Marshall Pailet with musical direction by Rona Siddiqui and choreography by Misha Shields, Who’s Your Baghdaddy? Or How I Started The Iraq War is based on a screenplay by J.T. Allen. Inspired by a true story, Who’s Your Baghdaddy? 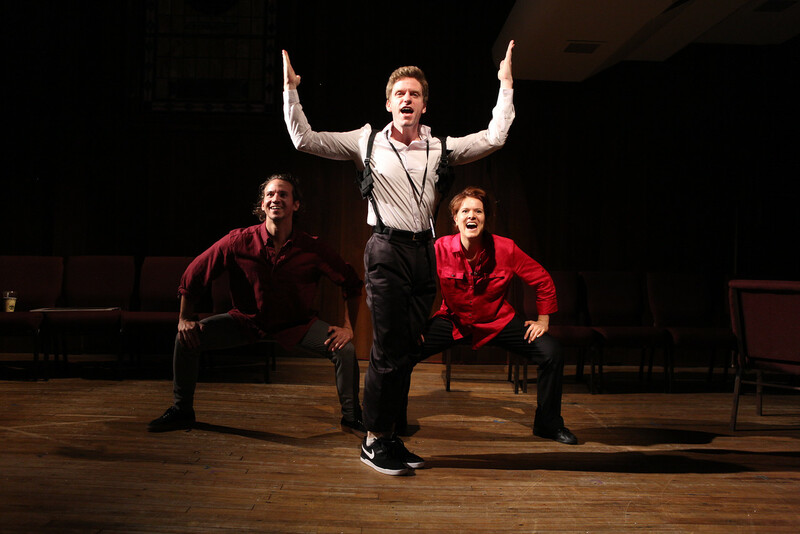 is a new musical comedy, presented as a support group for people who started the Iraq War. Dark, boisterous and irreverent, the story follows a handful of mid-level spies whose vanity and office politics contributed to the worst intelligence blunder in modern history. Cast includes: Brennan Caldwell (Regional: Urinetown. NBC’s “The Sing-Off”); Jason Collins (National Tour: Annie; NYC: Signs of Life); Brandon Espinoza (Broadway: Gypsy, Big, Les Miserables); Olli Haaskivi (NYC: Saturday Night; Film: The Funeral Guest); Nehal Joshi (Broadway: Les Miserables, The Threepenny Opera); Claire Neumann (NYC: Triassic Parq). Larisa Oleynik (Nickelodeon’s “The Secret World of Alex Mack” Film: 10 Things I Hate About You); Creative team includes: Bob Drogin (Creative Consultant), Nora Ives (Associate Director), Hope Villanueva (Production Stage Manager), Daryl Eisenberg (Casting) Who’s Your Baghdaddy? Or How I Started The Iraq War is presented by Charlie Fink and Lee Seymour. This musical was funded by and produced through The New Musical Foundation. In 2011 a workshop production of Who’s Your Baghdaddy? Or How I Started The Iraq War was first presented in Washington D.C where it was called “hilarious, creative, clever, and inspiring.” DC Theatre Scene; “Leaves the audience laughing, but – like all good satire – thinking as well.” Voice of America; “It’s just plain fun.”DCist; “This play is a can’t-miss for anyone still bitter from the Bush Administration and not sure what to do about it, which is to say, almost everyone.” DC Theatre Scene; “It provides a reminder of what happens when your government wants to imbibe fantasy and fanaticism over empiricism and reason–while forcing you to laugh your arse off.” Crooks and Liars. Tickets are $47.50 and can be purchased by visiting whoisyourbagdaddy.com. 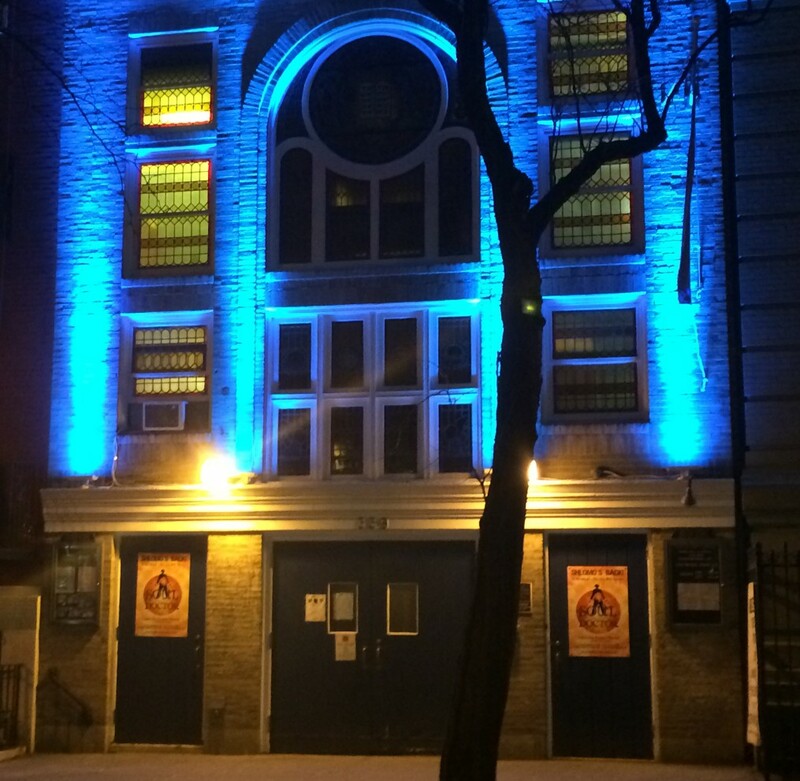 Actors Temple Theater is located at 339 W 47th St. Inspired by a true story, Who’s Your Baghdaddy? is a new musical comedy, presented as a support group for people who started the Iraq War. Dark, boisterous and irreverent, the story follows a handful of mid-level spies whose vanity and office politics contributed to the worst intelligence blunder in modern history! MARSHALL PAILET(Music, Book/ Director) is absurdly grateful to the talented and dedicated actors, creatives, and producers who have helped this show come to life! Writer/Director: Triassic Parq (Off Broadway, LA); Claudio Quest (NYMF ’15); Loch Ness (Chance Theater ’15); The Chocolate Tree. Film: VeggieTales: Noah’s Ark (Original Songs). As Director: Eudaemonia; Uncle Pirate; Stuck; The 49 Project; Thursday; With Kings in the Back; Bat Boy; Escape Artists; One Flew Over the Cuckoo’s Nest. He is developing stage musicals with RKO Stage and DreamWorks Theatricals. Graduate Yale University. marshallpailet.com. A.D. PENEDO (Book and Lyrics). Musicals (lyrics, co-book): Loch Ness (Chance Theater ’15); The Chocolate Tree (ACE Theater, Eugene); Where It’s At (New Haven); Cratchett Farm (Dillons, NYC). Plays include: The Three Times She Knocked (Best Playwrighting, FringeNYC); Off the Record (New York); Thursday (New Haven); Dance of the Fireflies (Payan Theater, NYC). BMI Lehman-Engel Musical Theater Workshop; ASCAP Musical Theater Workshop. http://www.adpenedo.com. RONA SIDDIQUI(Music Director) 2014 ASCAP Mary Rodgers/Lorenz Hart Award, 2011 ASCAP Foundation/Max Dreyfus Scholarship, 2010 Best Musical Direction – Bay Area Theatre Critics Circle SF. Musicals: One Good Day – ASCAP/Dreamworks Musical Theatre Workshop. The Tin – Samuel French OOB Short Play Festival. Featured songwriter: Sondheim Remix – NY City Center, Broadway’s Future at Lincoln Center. MISHA SHIELDS (Choreography) dance & aerial circus choreography credits: Off-Broadway’s interactive dance party, The Orion Experience (XL Nightclub), Merrily We Roll Along (APAC), Rocky Horror (Yale), Follies (TheaterWorks), The Travels (NYMF), Hey, You Know What Movie Would Make A Good Musical? (Julia Miles/Zipper Factory), Company (Fordham), Cabaret and Sunday In The Park… (Boston Conservatory), Perks of Writing A Musical: Web-Series (DIGGSY Productions), Victory Drill: Music Video (Threefifty Duo). mishashields.com. CHARLIE FINK (Producer) since 2006, Charlie has produced over 30 readings, workshops, and festival productions. He is the Producing Artistic Director of the not-for-profit New Musical Foundation, and currently serves as Chairman of the Board of the New York Musical Theater Festival. Charlie’s passion for new work began at Disney in 1986, where he supervised the development of the historic animated musicals Beauty and the Beast, Aladdin, and The Lion King, which was based on his original idea, “Bambi in Africa”. It all begins at the Frankfurt airport, when the only political-asylum specialist available who speaks Arabic is a nervous junior detective on the job for less than a week. Sure, sure, he can handle the talkative Iraqi defector. 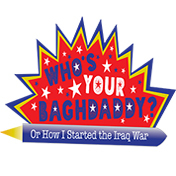 In “Who’s Your Baghdaddy? Or How I Started the Iraq War,” an important, cunning, rock-solid musical comedy with a terrible title, the mistakes start there. A well-meaning C.I.A. employee confuses credibility and reliability — words that have very different meanings, we learn, among intelligence people — in a translation. Things like that just keep happening. I don’t know how the Iraq war started, but this is the most plausible explanation so far. If you ever thought about the whole thing and wondered, “How could people be so stupid?,” here’s how: fear of being wrong, fear of admitting being wrong, the temptation of a life-changing promotion and other helpless, thoroughly plausible acts of ego. The show is set in 2001. Act II begins on Sept. 11, with vows of revenge. This is an Off Off Broadway production, for better and for worse. The cast works in the round at the Actors Temple Theater, on the theater floor, and almost everybody (the maximum audience is 50 or so) sits in the front row. When you cross your legs, you run the risk of kicking an actor. The orchestra consists of a keyboardist and a drummer. Caite Hevner Kemp’s set is a table and a few cushioned chairs. The cardboard props include a Krispy Kreme box that plays a computer. Yet the staging (Marshall Pailet is the director) is fast-paced, expert and perfectly proportioned. Mr. Pailet’s music and A. D. Penedo’s lyrics (they wrote the book together, based on an unproduced screenplay by J. T. Allen) are modestly eloquent, as storytelling (like “Second in Command”) and in character-driven numbers (like “I Am Das Man”). Misha Shields’s choreography is inflected with early Bob Fosse, so it’s probably no accident that the two slinky State Department characters wear black fedoras. “This is an ensemble effort and all eight members are excellent. There are laughs aplenty, but the humor is black”. Walk into the Actors Temple Theater, and you find yourself in the middle of a support group for people who started the Iraq War. No, Bush and Cheney aren’t there (thank heavens!) but mid-level spies and specialists shared in the terrorist-driven misinformation that ran rampant during the months following September 11th. Throw in some office politics, personal self-aggrandizement, and group hysteria, and the stage is set for chaos and calamity. Marshall Pailet’s and A.D. Penedo’s WHO’S YOUR BAGHDADDY? Or How I Started the Iraq War adds song and dance, along with sophisticated humor, to make the insanity somewhat palatable. This high-energy production is graced with a multi-talented cast who reveal the characters involved in the catastrophe, singing and dancing their hearts out. And the audience enjoys sharing the hilarious and audacious storytelling in the first act. But alas, WHO’S YOU BAGHDADDY? is based on truth, and no matter how ridiculous the circumstances under which the United States went to war with Iraq, there were and still are consequences for that decision. Some of them are dealt with in the second act. Unless you are one of those rare people who think the war was a reasonable and justifiable reaction to 9/11, you feel the anger and despair returning as if was 2003 all over again. Based on a screenplay by J.T. Allen, Penedo and Pailet use comedy to remind us of a tragedy, and they do it brilliantly. Go see WHO’S YOUR BAGHDADDY? It is totally unique. Sometimes it’s the stories that you don’t know about but the events you do know that are the most fascinating. Unless you were living under a rock in the first decade of the 21st century, you will know something about the Iraq War. But what if there’s more to the story? Inspired by the screenplay “Curveball” by J.T. Allen, Who’s Your Baghdaddy, or How I Started the Iraq War is a musical comedy, yes comedy, that brings new light to America’s darkest times. With music by Marshall Pailet, lyrics by A.D. Penedo, and book by both Pailet and Penedo, Who’s Your Baghdaddy brings the audience into a fictional support group where members seek solace, acceptance, help, and closure. The catch is, the members of this group all believe that they started the Iraq War. Told through a series of flashbacks, Who’s Your Baghdaddy breaks into musical mode, flipping from campy musical comedy to heavy melodrama. While stylistically the musical is unsure of itself, the way the story is told is expertly crafted. Fourteen years after 9/11, it’s possible that it’s still “too soon” but what Pailet and Penedo have done is avoid glorifying the subject. They present their material in a fine manner. Though, this may be due to the unrecognizable characters and unheard story. Had this musical been about Osama Bin Laden, George W. Bush, and Saddam Hussein, you’re likely to feel that the piece was unsavory. Regardless, with strong storytelling and characters each with a sense of redemption, Pailet and Penedo were able to take the audience on an unfamiliar journey. Audiences love to play detective, learning the clues and linking the facts. Pailet and Penedo fashioned the musical in a way that was accessible and engaging. The characters they crafted each had a strong motivation and a sense of redemption. From the desire of becoming a hero or wanting to do something right, each objective was clear and followed through. When it came to the music, Pailet and Penedo used a wide variety of styles. Who’s Your Baghdaddyblended classic Broadway with pop and rap to reach everyone’s pallet. Each character seemed to live in a specific genre but it may be a smart idea to ease off the theatrical rap. Penedo’s lyrics for the most part were stronger in the more comedic numbers, falling off into hokey melodrama in the ballads. Who’s Your Baghdaddy was certainly an ensemble effort. The characters depended on one another and so did the company. Sometimes it’s the utility players that end up being the strongest actors on the stage. And that was very true here. Brandon Espinoza and Claire Neumann as the multi-character ensemble of two were brilliant. Espinoza and Neumann are triple threats that went beyond the call of duty. From on point dancing to an array of voices, Espinoza and Neumann were the heart of the production. Brennan Caldwell as Richart Becker, the German Jr. Detective brought the house down with “Das Man.” Caldwell is sweet and charming with big heart as the optimistic Richart. He was even game to play along with the overly-recurring accent bit. As dynamic duo Berry and Jerry, Larisa Oleynik and Olli Haaskivi were a perfect yin and yang. Oleynik brought grit and immense depth to Berry while Haaskivi’s Jerry just wanted to make Berry proud. Jason Collins, Bob D’Haene, and Nehal Joshi all had characters that lived primarily in the melodrama. They each had defining moments with their power and strength. Collins commanded the stage, even in his time of defeat. Directing your own work is a massive risk. Luckily for Marshall Pailet, it paid off, this time. Pailet’s use of the space was smart, allowing the fascinating story take center stage. The transitions were quick and Pailet paid attention to symmetry. As a whole, the movement of the piece was sharp and Misha Shields’ choreography utilized the space well. While the playing area may have been tight, Sheilds’ made it feel grand. Since the playing area was virtually the audience of the Actor’s Temple, lighting designer Jen Schriever’s canvas was unique. She was able to capture the support group general lighting and quickly create a more theatrical aura. Sure, shadows and dark patches were a bit of an issue, it was easily forgiven. Who’s Your Baghdaddy is a fascinating story with a strong ensemble. But that title. It could be a massive turnoff that does not sell the show properly. The musical is not so much satire as it is musical comedy and finding that middle ground title will encourage an audience that it’s time to start talking about the war that shouldn’t have happened. Don’t let the title of Who’s Your Baghdaddy? Or How I Started The Iraq War, turn you off. It is an hilarious, creative, clever, inspiring, fresh breath of air with a score that I would buy right now, if I could. This new musical by Marshall Pailet (Claudio Quest, Triassic Parq) and A.D. Penedo (The Three Times She Knocked), is based on a screenplay by J.T. Allen. The show is also directed by Marshall Pailet, with musical direction by Rona Siddiqui and choreography by Misha Shields. All of these names are the new up and coming talents of musical theatre and breath new life into this form. The show is as terrific as dare I say it, Hamilton. Musically it has strains of Hamilton and Assassins, but it has it’s own unique voice. Add to that exquisite harmonies done by a uber talented cast and musically, you will be in heaven. Done in the format of an AA support group for those who started the Iraq War. 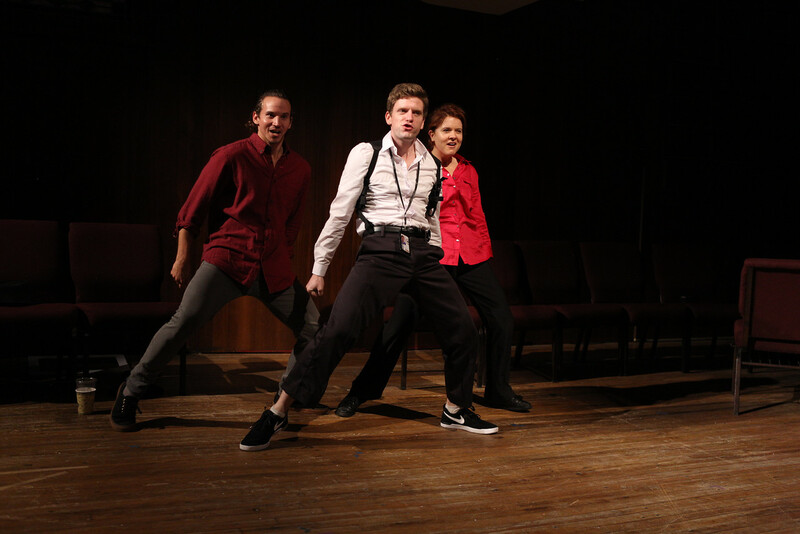 You will hear “I’m _________ and I started the Iraq War.” Brandon Espinoza and Claire Neumann act as the leaders of the group and take on the supporting roles, as you learn how each character did indeed start the Iraq war. We meet the mid-level spies whose foibles contributed to the worst intelligence blunder in modern history; Curveball (at the performance I saw Pomme Koch), an Iraqi defector and the only source on the biological Weapons of Mass Destruction, the German detective Richart (Brennan Caldwell) who gives the unverified story to analyst duo “Berry (Larisa Oleynik) and Jerry (Olli Haaskivi ),” CIA analyst Nelson (Jason Collins) and eventually to former weapons inspector David Kay (Bob D’Haene) whose words actually may have been the cause and effect. Though Former President George W. Bush is never seen, his State of the Union speech is heard. As well as Secretary of State Colin Powell’s speech to the United Nations in which he quotes Curveball’s flawed information. “Curveball” was the code name the CIA gave to the now notorious Iraqi defector who fed U.S. intelligence officials much of the flawed information that they collected about Iraq’s weapons of mass destruction program. It is hard to single people out but Mr. Espinoza and Ms. Neumann are both comedically brilliant as well as vocally superb. They are so good at what they do it is hard not to give a shout out. 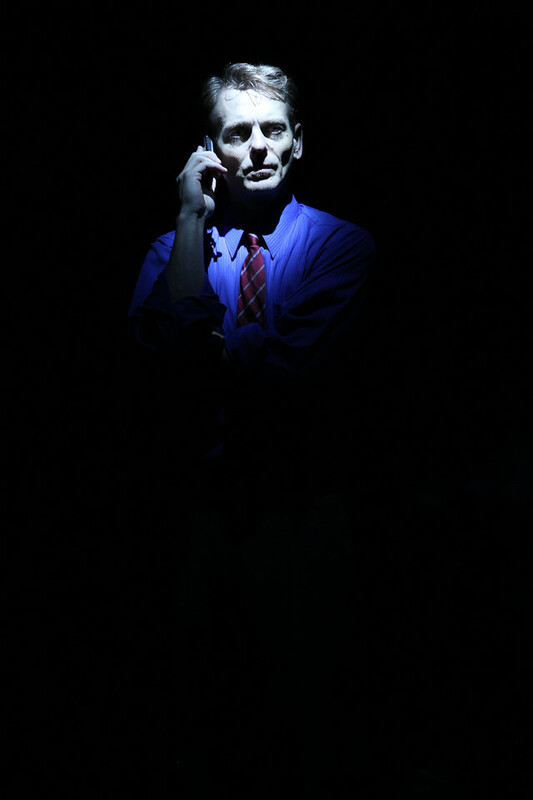 Mr. Koch’s voice and the sensitivity he brings to his role is stellar and to think he was the understudy. His song “Stay” is glorious. Each cast member brings their A game and it shows. Misha Shields’ choreography is simple. Like Andy Blankenbuehler’s choreography, you want to learn it and incorporate it into your movements. Pailet’s direction takes a small space and together with Ms. Shields creates something so unique with the simplest of props. Rona Siddiqui’s music direction and arrangements are truly wonderful and it is so well done. One piano, a bongo and a cast who knows their craft can create an exciting musical. This show is absurd and devastating all in the same breath. Like the play Quills demonstrates words can start a war. I didn’t just like this show, I loved it. My prayer for Who’s Your Baghdaddy? Or How I Started The Iraq War is that it catches on, gets a cult following and extends and extends. This should be a bonified hit. War, apparently, is a laughing matter. “Who’s Your Baghdaddy? 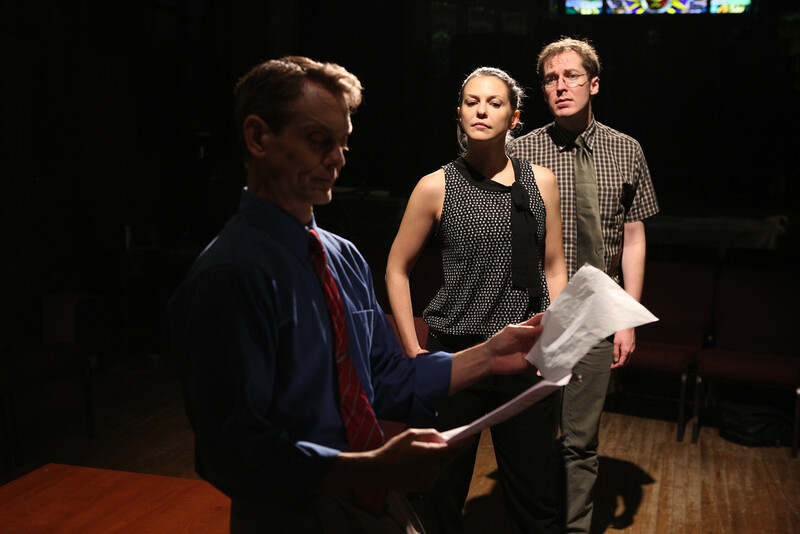 Or How I Started the Iraq War,” the quirky musical by Marshall Pailet and A.D. Penedo playing off-Broadway at the Actors Temple Theater, is surprisingly entertaining. While inspired by true events, it sounds like a train wreck: A show presented as a support group for mid-level spies and analysts whose mistakes led to the Iraq War. But the actors are strong performers, and there are lots of fun and silly moments. Things turn more serious after intermission, the post-9/11 world. Still, you are likely to leave the theater smiling, and perhaps a bit angry at a former president and his administration for thinking that Saddam Hussein was hiding weapons of mass destruction. Then there’s Richart Becker (Brennan Caldwell), a German junior interrogator who believes Curveball (Nehal Joshi), an Iraqi defector who says his country has biological weapons in mobile vehicles so they are more difficult to find. His story seems to check out. Tyler Nelson (Jason Collins) is a no-nonsense guy, CIA operative and company man. There are rules and procedure to follow. Yes, CIA analysts Jerry Samuel (Olli Haaskivi) and Berry Stanton (Larisa Oleynik) believe their German counterpart, but Nelson is not convinced. He needs more proof. Playing a variety of roles and helping Espinoza provide comic relief is Claire Newmann. Espinoza is in many ways the center of the show. When he’s not playing various characters, he returns to the group leader role, calling on someone to state their case. He brings a lot of expression and talent to this small stage. Pailet, the co-writer, directs the production well. The audience (less than 50 people) sits in a circle, and the action takes place in the center of the theater. In the beginning, most of the actors sit with the audience, but some arrive from the main entrance or the back. There are minimal props and sets, save for a few chairs and a table. The songs (music by Pailet and lyrics by A.D. Penedo) are made to make you laugh and think. Music director Rona Siddiqui helms the keyboard and does a fine job. In terms of voices, Joshi’s tenor is the most impressive. When he sings “Speak to Me Tomorrow,” you pay attention. This show was first presented in 2011 in, appropriately, Washington, D.C. One critic indicated that those bitter from the Bush administration will appreciate it. That’s certainly true, but you don’t have to be a Democrat to enjoy this show. In the program, the “Baghdaddy” team dedicates the performance to those Americans and Iraqis killed and wounded. The numbers are staggering.